MultiTouch Ltd has supplied the world’s biggest interactive multitouch installation and the largest continuous array of unlimited touch displays, within Queensland University of Technology’s (QUT) innovative digital interactive learning exhibition space, ‘The Cube’—the heart of QUT’s new A$230 million Science and Engineering Centre. The exhibition includes 48x55-inch ultra-thin bezel (UTB) MultiTaction Cell displays, forming the 1,400 cubic metre Cube. 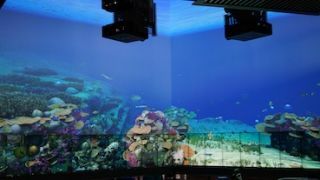 The Cube comprises 6 educational zones, including the two-story, 14-meter-long Virtual Reef where 20 Cells combine with an edge-blended Panasonic projection system, and the innovative Physics Zone. MultiTaction Cells are interactive displays with an ultra-thin bezel LCD and were developed by world-leader in interactive multitouch display systems, MultiTouch Ltd. A major advantage of the ultra-thin bezel is in stacked configurations just like this where a mullion of only 6mm can be achieved, resulting in a near seamless finish. The Cube is open to the public at QUT’s Gardens Point campus in Brisbane, Australia, following a grand opening by Australian Prime Minister Julia Gillard. It was built by Pro AV Solutions Queensland—Australian member of the Global Presence Alliance—and is one of the biggest spaces of its kind in the world.